I spent a long time deciding on Glock vs M&P for first my concealed carry gun. If you are looking for a difference in reliability or accuracy, they’re essentially dead even. But there’s more than just reliability and accuracy to a good carry pistol. It’s all the little things that add up to make an ideal carry pistol. This article is about those littler things. Both Glocks and the M&P series have a well deserved reputation for reliability and accuracy. That’s good because if a pistol isn’t reliable and accurate, I won’t even consider it for self defense. If you’re Jerry Miculek, or another professional competition shooter, maybe you could find a difference in accuracy. For the rest of us, the difference is so small it can be ignored. I’d bet the fit of the pistol to your hand would make a bigger difference for most people. I won’t even get into the reliability debate. Suffice it to say that unless you abuse them beyond reason, they’ll both go bang every time you pull the trigger. Now lets talk about all those little things that matter. I literally spent years researching the ideal concealed carry pistol before I could afford to buy one. My very first gun was a Smith & Wesson M&P9c (the “c” standing for compact). I bought it because concealed carry had finally become legal in Illinois. (Yay!) It took a while for me to save up for the class, and I borrowed my brother’s M&P9c to take it. Allow me to preach about this holster for a moment. Long Story short, I think it’s the perfect holster. Right now, I would only carry a pistol if they make this holster for it. Seriously, it’s THAT GOOD. Maybe that’s backwards (picking a gun based on holster) but since Glock and M&P are options I’m fine with backwards. It concealed my M&P9c perfectly, didn’t add bulk or noticeable weight, never dropped the pistol on accident, and always released it when I needed it. So yeah, in my opinion the perfect holster. Anyway, Three things about the Compact bothered me. #1 The weight. I’m a fairly small guy at 5′ 7″ and 145lbs. With twelve 147gr bullets, it was just a little too heavy to be comfortable for me. Later, I switched to the 74gr Ruger ARX, which shed 2 ounces and brought the weight down enough to be barely comfortable. #2 The Trigger. The factory stock trigger is barely tolerable. The take-up is fine, but there’s a lot of creep in the second stage. Even worse, there’s a sort of “false reset” before the real reset in the trigger. It’s just not a fun trigger to shoot. That said, the APEX tactical Duty/Carry Action Enhancement Kit turns the “meh” M&P trigger into a Fantastic trigger. Easily the best trigger I’ve ever felt on a Polymer-framed, striker-fired pistol. No Exceptions. #3 The barrel was too short to be comfortable. With the pistol riding high enough to get a full grip on it, there was just as much pistol above my belt as below. This made the top of the gun tend to ride out. That in turn made it feel “floppy” and made it print slightly more. I wasn’t 100% happy with it, but it’s an excellent little gun. I did end up liking them, but there was one thing I just couldn’t get past. I hated the way a Glock felt in my hand. They just weren’t comfortable to me. Then I held a Glock 26 with a pinky extension. It felt Perfect. Just as good as my M&P9c, possibly a little better. 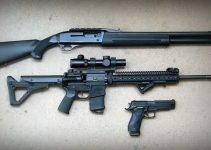 But it still had a short barrel, and if I was going to buy another gun, it needed a longer barrel. Then I got the idea to chop a longer/larger Glock’s grip down. Long story short, this is my current concealed carry pistol. It’s a Glock 34 MOS with the grip cut down to accept Glock 26 magazines. I did the Glock Grip chop myself. I put a G26 over my G34, lined the pin holes up using some spare pins and used masking tape to mark the cut. A saw got it close, then I finished up with an exacto knife. I keep a Pearce +1 extension on the magazine, giving me 11 rounds in the mag. I know it looks weird, but I absolutely LOVE this configuration (Long barrel, short grip). The longer barrel improves accuracy and helps me get on target faster at all ranges. Plus, my carry ammo benefits greatly from higher velocity. It’s larger than a typical concealed carry, but it suits me perfectly. Plus, I shoot my G34 much better and faster than my compact. And as I’ve said before, you can’t miss fast enough to win a gunfight. I used to HATE Glock triggers. No really. I could rant about how much they stink. I’ve since changed my mind. 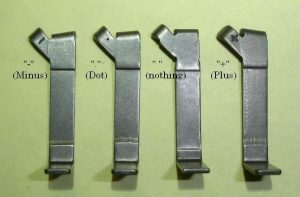 No, a Glock trigger will never compete with a tuned 1911 match trigger. Glocks will always have slightly mushy triggers unless you put a “+ Connector “. However that brings the pull weight up to around 8 pounds. Stock Glock vs M&P triggers are a matter of personal preference. They’re both tolerable. Upgraded triggers are a whole different ballgame. If you install the Apex Tactical Duty/Carry Action Enhancement Kit (DCAEK) into an M&P pistol, you’ll have an excellent trigger. It feels much like a 1911, only with longer take up in the first stage. The break is clean, the reset is very short, and the pull weight is ideal. They are harder to upgrade. Sort of. Changing the parts on a Glock is MUCH easier and there are endless options. But the differences between most parts are tiny at best and boil down to two basic changes. Spring kits. These kit include a combination of springs to lighten the trigger pull. A stock Gen 4 Glock will have a trigger pull around 5 – 5.5 pounds. Other than changing the pull weight, they really don’t have much effect. Connectors. Changing the connector will change both the pull weight and the “feel” of the trigger. There are currently four Glock connectors. From lightest pull to heaviest they are the “minus”, “dot”, “standard” and “Plus”. The heavier connectors (like the plus) have a more crisp break, but also a heavier pull. The lighter connectors (like the minus) Will be more mushy on the break, but lighter pull. Personally, I think chasing light triggers is silly. Anything in the 4-6 pound range is plenty light enough. Heavier makes accurate shooting harder (for me) and lighter makes it hard to precisely control the break. Not only does it limit liability in a courtroom, but after polishing the components much of the mushiness went away. It’s not perfect, but it works well for my needs. Most triggers will reset when the slide locks back. Sometimes I don’t notice the slide is locked back and therefore start my next shot only to find I’m empty. With a Glock, I know almost instantly. I have come to REALLY like that feature. Honestly, I would prefer that feature over the more crisp 1911-like trigger of a M&P with the Apex kit installed. My Glock 34 can already shoot bug holes when I do my part. Knowing I’m out of ammo is more important to me than a perfectly crisp break. Okay, so here I’m going to disagree with some manufacturer’s specifications. Glock’s website says a Glock 34 weighs 25.77 ounces. 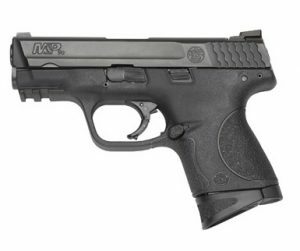 Smith & Wesson’s website says the M&P9c weighs 21.7 ounces. 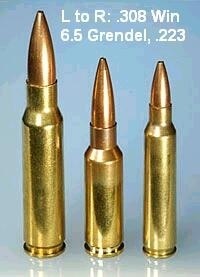 The stats say the Glock is 4.07 ounces heavier, and that 1/4 pound is a pretty big difference. Holding my M&P9c and my grip-chopped Glock 34, the Glock feels slightly lighter. It’s not much, but the difference is there. When I started carrying my Glock I noticed that it felt lighter and was more comfortable longer than the M&P9c. I have asked other people (who didn’t know the stats) to tell me which felt lighter. They all say my Glock 34. Maybe it’s something about how the weight is distributed. Perhaps the website specs are off, or maybe I’m just wrong. Possibly I’m crazy, all my friends are crazy, and I measured wrong. I honestly don’t care which because weight wise, the Glock is more comfortable to carry for me. 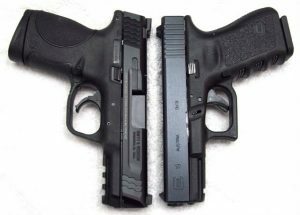 I realize that’s only comparing two of the many options that Glock and M&P offer, but Glocks are consistently lightweight for their size. Usually lighter means more recoil, but I haven’t noticed that they recoil more than any other gun around their size. Lighter does mean more comfortable though, and I’m all for that. Glocks are blocky, but the the M&P series is… Well there’s no other way to say it. They’re chunky. Don’t get me wrong, I love my Little M&P9c. However, that enormous slide is a little harder to conceal than the (comparatively) trim Glock slide. I might be overstating things a bit. The difference in width between them is only about 1/16th of an inch, but in person it seems much larger than the specs make it sound. And I may be crazy, but I feel (subjectively) the thinner slide on the Glock conceals better. Maybe not much better, but better. 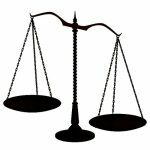 For height and length, it depends on what you are comparing. The full size Glock and the full size M&P are about the same size. The Glock 19 is definitely larger than the M&P9c, but it holds a few more rounds and has an extra half inch of barrel. The Glock 26 is much closer in size to the M&P9c, though slightly smaller. The M&P Shield is definitely larger than the Glock 43. Almost everyone who picks up an M&P shield LOVES the way it feels in their hand. Seriously. Very few people don’t like it. A lot of people like the Glock 43, but not as many because it doesn’t fill their hand completely. The Glock 26 and M&P9c are favored by people with small hands. (including me.) People with medium to large hands usually find them a bit small to get a good grip. A lot of people like the way the Glock 19 feels in their hand. Not quite as many as the M&P Shield, but a lot. It seems to fit most hands well, except the very smallest and very largest. 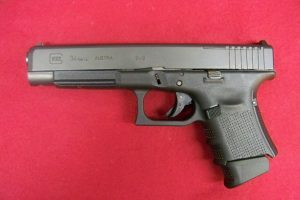 Most people who pick up the Glock 17 and a Glock 19 seem to prefer the G19. The biggest comment about the M&P full size is that it feels good, but is too big/heavy to carry. The Glock vs M&P series ergonomics is something you’ll have to try for yourself. So, I’m going to end with some often repeated (even cliche) and sage advice: Shoot both and pick the one you shoot better. Yes I know you’ve heard this advice everywhere else you’ve looked too. There’s a reason for that, and I repeat it all over the website. You can’t miss fast enough to win a gunfight. I gave the same advice at the end of my 9 vs 40 vs 45 article. What matters to me are rounds on target, not Glock vs M&P or the size of the hole in the barrel. Again, shot placement is king. If you’ve read my article on terminal ballistics, you’ll get plenty of scientific reasons. Fortunately this doesn’t need much explaining because it passes the common sense test. If you need more proof, check out this Interview of famous western lawman Wyatt Earp I found a while back. 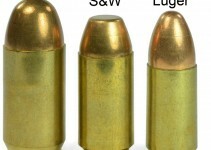 The experts agree, it’s not Glock vs M&P that makes the difference in a gunfight. It’s good vs poor shot placement. Now if you were thinking competition shooting, I would suggest you take a hard look at an M&P with the Apex Trigger Kit. If you want the best possible accuracy for competition, that Apex Trigger Kit will help. That said, I don’t shoot my little M&P9c much any more. 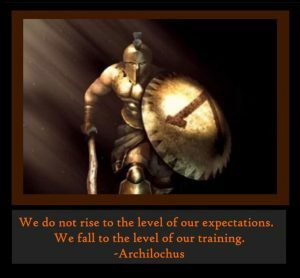 I firmly believe the mantra “Train how you fight“. Because of the that, I do almost all my pistol shooting with my grip chopped Glock 34. It’s the pistol I trust my life to, and I want to be as proficient as possible with it. That means lots of practice with it, so I shoot it way more than my M&P. Originally, I dipped into savings to buy the G34, then was going to sell the M&P9c to replace the savings. But I just couldn’t sell her. That little M&P9c was the first gun I ever bought and when the time came to sell her, I just couldn’t do it. She treated me so well, did everything I asked, and never once choked on any ammo I fed her. I love my G34 and plan to carry it for the foreseeable future. But there’s something missing about it. It’s just a tool for me. The Glock works better for my purposes, but it lacks the soul of the M&P. Me: It’s not you, it’s me. I just feel like we’ve grown apart as people you know you know? You’ll always have a place in my safe, just not in my holster. M&P9c: Okay, I understand. I’ll always be in the safe waiting for you. Me: I don’t deserve you. That’s my take on the Glock vs M&P debate. I do carry a Glock now, but I couldn’t get rid of my M&P. I suggest shooting both and deciding from there. Great article. As a owner of both a Glock 21SF and M&P 9, I was able to find the needed detail in this article to assist me in the needed trigger jobs. G34 conceals better than the M&Pc! As the old saying goes “Don’t knock it until you’ve tried it“. And don’t forget I cut the grip down on the G34 so it’s the same length as the M&P9c. Your Glock 34 looks more ridiculous than the 19x and that’s saying something. When I first became an officer and came to my department we used .40 S&W M&Ps. About two years later our chief jumped onto the Glock bus and switched us over… my range scores instantly dropped from consistent high-90s to low 80s. After screaming and crying for the better part of two years, multiple trips to the armorer complaining about the trigger I found out the following: A captain at the time was so worried about negligent discharges that he demanded a 9 pound trigger be put in the original batches. 9 pounds of pure hate. A new trigger put in a few years later and I’m back to the high scores I’m used to. I still get PTSD when I unholster that glock though. Taught me a lot I didn’t think really affected me: what is comfortable in your hand, and has a decent trigger is what you should carry. Some cops love the Glock. I still pine for the M&P on duty. I love the feel of the M&P 9mm but find the trigger lacking. I feel the Glock 19 square and uncomfortable to hold. I shoot the Glock much better. I consider changing the trigger on my M&P but hesitate because I worry about civil liability if I carry a gun with a modified trigger. I haven’t shot the M&P full size 9 much but do dry fire practice. No change in the trigger so far. I carry a revolver or the Glock depending on where I’ll be that day. When I’m in a dodgy area I carry the Glock that day. I love these articles and the replies and love hearing good advice and good stories. This is really a great forum. The civil liability issue is a myth. But I don’t like changing internals; any time you do that you run the risk of increasing chances of a malfunction/failure. Good information. Thanks Abe. I appreciate it. Now that the M&P 2.0 Compact is out you should try this comparison taste test again. I had a 9C and disliked all the same things you did. I had a G19 (1995-2008) and never got used to it. Grip angle was a definite problem, trigger reach may have been another, as it is with many pistols (genetics left me with a short trigger finger; weird, I know). But I will say the G19 is the right size and balanced much better than the 9C. So, now I have the new-ish M&P 2.0 Compact 4” and it’s perfect for me. Same size as the G19 but without the…”different”…grip angle and with a trigger I can easily reach (as with all M&P’s). It is, at the least, an interesting alternative. This is the most ridiculous thing I’ve ever seen. The cartoonish proportions of that gun hahahaha. Does it just wanna flop forward out of your hands? Obsessed with a holster that that didn’t allow you to comfortably carry a sub compact weapon without it printing?! Hats off for the most retarded carry gun I’ve ever seen. I was able to forgive the retarded holster, but I stopped reading after I saw the carry. Honestly asked myself if this was satire.